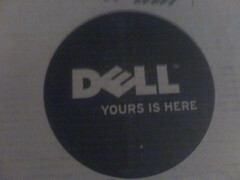 After a lack in communication, several delays, and a reorder, my Dell Mini 9 has arrived. The first thing I did after taking it out of the box was installed Windows 7 on it. So far, I’m extremely impressed – all the drivers loaded nicely, and I haven’t had to do anything special to get it to work. Of a 14GB drive, the operating system took up around 7GB of that. Even with a 1.6 GHz Atom processor and 1GB of memory, I’m not seeing any performance issues so far. I can’t get over how small this is. As I mentioned last night, if my laptop had a lap, this Mini 9 would be its laptop. This would have been perfect for CodeMash – lightweight, with all the basic features that I would use. You won’t see me playing EVE Online or any of my graphics intensive games on this. However, you may see me blogging, IMing, Twittering, and even video chatting with this. It has its own built-in camera, making it even easier for me to stay in contact while traveling. So within my first 24 hours of playing with this, I’m liking it so far. It just stinks that Dell and Adobe dropped the ball and made the process of getting it such a huge ordeal.